I have met some incredibly talented individuals through blogging: today I’d like to introduce you one of them…jewelry designer Elizabeth Plumb! Elizabeth lives at the base of the Rocky mountains. She’s avid outdoorswoman with three small kids, and she spends her evenings designing beautiful jewelry. Her grandfather owned a jewelry shop when she was a child: she loved the back where the design and production took place. She started making her own jewelry after college, and her big break came when a buyer from the Sundance catalog walked into her booth at a farmers market. 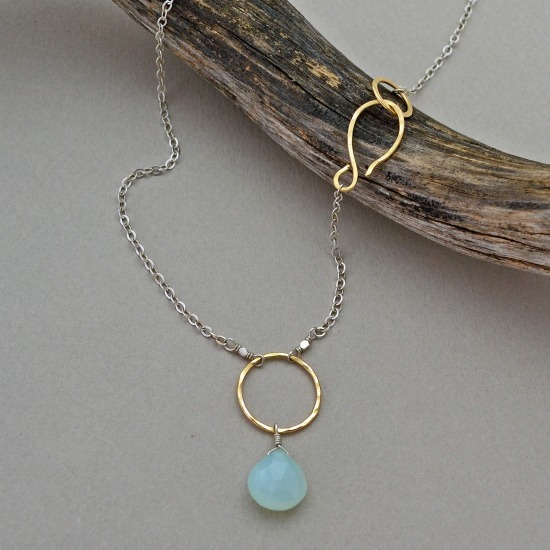 Elizabeth’s designs are inspired by the metaphysical properties in the stones she uses, and she currently makes pieces for both the Sundance catalog and her own website. She has generously offered to give one of my readers a $100 gift card to put toward something(s) on her site (disclosure: she sent me one, too, and I bought a necklace that I love). I am pleased to share Elizabeth’s work with you and I hope that you will support her and other artists, as well as your local merchants, when you make purchases this holiday season! And FYI: Elizabeth is offering 15% off everything on her site, plus free shipping, through the holidays! This giveaway is open to everyone, everywhere! That’s right: you can enter no matter where in the world you live. To enter this giveaway, please use the Rafflecopter widget below. For your mandatory entry, you must leave a comment here on my blog. You may gain an additional optional entry by signing up for my mailing list (this will ensure you receive my blog email updates and/or my monthly newsletter…you may unsubscribe at a later date, but you must be signed up in order to be eligible to win the giveaway). You may gain another optional entry for liking my Facebook page. GOOD LUCK! I would try to buy matching for my sister and I. The jewelry is gorgeous! I would love to treat myself to a new necklace! Absolutely beautiful. Would love to treat someone to one these pieces- maybe myself?! I would buy someone else something for christmas or birthday, I know aoo many people with december birthdays. Would love something for myself, but will give it to someone else I appreciate and needs it. 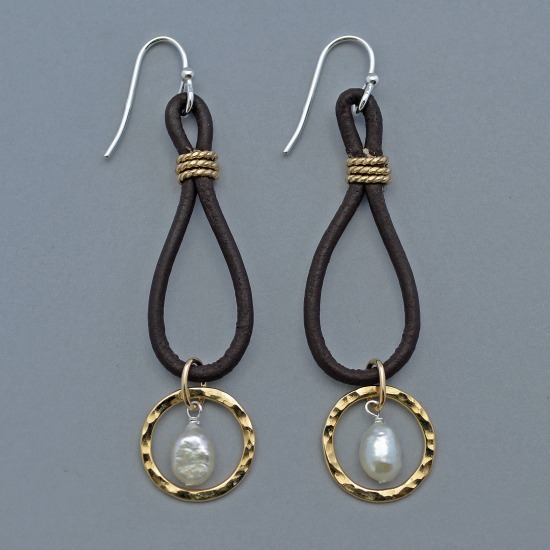 I love the earthy but chic quality of this jewelry! I’d like to buy something for myself. Love the jewelry you’ve pictured. Are you in Colorado? And if so, what farmers markets do you come to? I love the jewelry! Thank you for this giveaway! I would buy something for my Mom. Absolutely beautiful jewelry! I would use it to buy a gift for my sister for Christmas. I will probably shop for myself as well! I will most likely use it for others. Beautiful jewelry! I will check out her site and would love to win a chance to buy a piece. I LOVE that first necklace…I would either gift it, depending on who my secret Santa is…or save it for keeps! 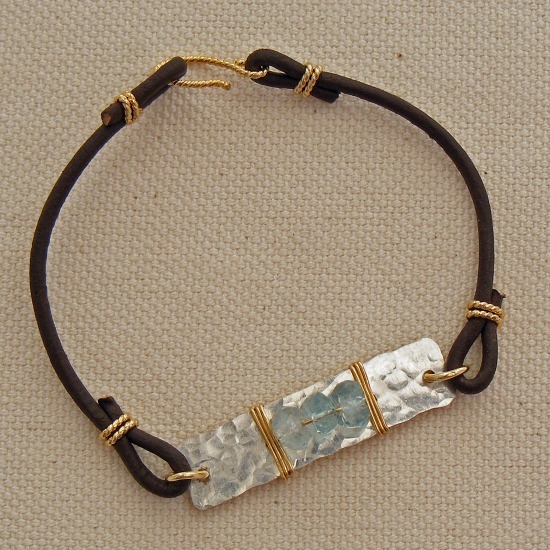 Love love love hand-made jewelry, beautiful I found your site via the chai oatmeal recipe – super! I would buy the Vibrant Lapis and Mixed Stones Bracelet, it is gorgeous! Fabulous jewelry! Love the natural feel! Whata lovely gft – a piece of jewelry for my mother in law, and one for my mom! Stunning! I would buy a gift for my niece! Oh, I like her stuff very much! Tks for the giveaway! Simply gorgeous pieces, nice to meet you too, Elizabeth. Her stuff is so unique! Love it! I’d use it to buy gifts. This jewelry is so pretty. I would love it. i would buy something for myself! I am all done with my Christmas shopping already! The necklace is lovely, and so unique! Thanks for a great giveaway! So many beautiful pieces, I would definitely buy something for my Mom ( and something for myself, I won’t lie). I’d do both… (aka I’d probably end up getting something for myself along with whatever gift I chose) haha thanks for the giveaway! Such beautiful and unique jewelry. I would love a new necklace, but it would also be fun to give such a wonderful gift. Thanks for the chance! Love your blog. Very cool jewelry…so hard to choose!!! This jewelry is gorgeous- my mother in law would absolutely flip if I got her one of these items!! Sundance Catalog features lovely jewelry pieces – I can see how her products would be sold from them. Very lovely and I love that she also uses the metaphysical qualities of the stones. Going to check out her website now too! Thank you! These are beautiful! I wonder if she can make her earring nickel-free? Beautiful jewelry! If I win, I might treat myself to an early Christmas present. I would get something for my mother and and something for myself. I would give something to my sis-in-law! I would buy something for my mom. The jewelry is beautiful, but with three boys ages 4 and under, jewelry just gets lost in my house. Oh wow, gorgeous work and talent! My favorite local artist. I own a couple pieces already and would love to have more! Elizabeth Plumb is my FAVORITE jewelry artist! I’ve been admiring her work for years at the SLC Farmers market and the Sundance Catalogue Outlet. Sadly the three necklaces I had saved for and carefully selected were never to be seen again. Turns out I have a three year old with a penchant for beautiful things as well, he just likes to put them down the bathroom sink. I’d probably buy something for my sister, because her birthday is coming up faster than the holidays and I still have to find a gift…and this jewelry is really beautiful. Love her stuff – heading over to her website next! My mom would adore this jewelry for a wonderful christmas gift! I wasn’t able to leave my comment on the site either so I am leaving it here. I love Elizabeth’s work and don’t buy jewelry (because I make jewelry) EXCEPT for hers! I wear her earrings more than my own! So should I win, gift buying will be for me as I make gifts for those on my list. Also I will be adding this great site to suggested blogs on my own blog. So glad I found this site! Either for myself or my twin sister!! I cannot decide yet! I’d probably get something for my sister. It would be a blessing, and many of the items look like just thing she would love to wear! Would love to get one of these beautiful pieces for my daughter for her birthday. I would shop for my sister with the gift card! She loves jewelry and love to buy it for her! i would shop for my sisters, mom, or mother in law with the gift card. You always have such interesting things on your site. Thank you!! Thank you for the opportunity to win some beautiful jewelry. Lovely. . . so many beautiful women in my family. . . I’m sure any one of them would be a happy recipient of something from Elizabeth Plumb’s beautiful work. I’d like to say I would be selfless and use the gift card to buy an item for someone else but sadly I am jewelry deficient so would treat myself! I would use the gift card towards gifts for my loved ones. beautiful designs! always love to find new artists!! I would buy something as a gift! I will give to my mother! What gorgeous jewelry! I would actually buy something for my friend as this is so her style! Ooooooohhhh I could really get some lovely things for special people with this gift card!!! Hmm.. havent decided if it will be for me or a gift… or maybe both! I’m very excited to read your new book! I would like to buy one for my mother. I would buy a gift for a friend we call a jewelry hound. What better could we give her? Her jewelry is so beautiful. Classic and beautiful–Would love something for me and for gifts! Oh these are just beautiful! I love how earthy they feel and all of the fun textures! I’d use it to buy a gift for someone for Christmas. I’ll probably use the gift card for myself. I am due for some new jewelry! My dogs just ate my favorite necklace :(. I would do both – buy a little something for myself and a gift for my brother’s girlfriend. I love Elizabeth Plumb’s line. probably use the gift card for my daughter….but I am known to buy things for myself when shopping for her! This artist’s jewelry looks amazing. I am off to visit her page. If I win, I will treat myself. something for me, and a gift! I think I’d buy something for someone else. I love jewelry but I just don’t end up wearing it often. I’m looking for a new bracelet. I’m going to her site now to shop for one. Thanks Dr. Winnie! Love her jewelry! It’s just beautiful!! Btw…I would buy it for myself if I won. Thank you! Her jewelry is gorgeous. I would buy delightful things for my friends. Not a big jewelry wearer, too many years of grabby small hands :) but this stuff is gorgeous so I may share with my daughters. I would use it to get something for my mother! I would have to buy something for myself I’m afraid.. that necklace you posted that you bought is AMAZING. I, too, love to make jewelry…I love your style, it is very distinctive! I would probably spend it on a gift. Thanks for the giveaway! Beautiful! I would buy my daughter a special gift. I would probably buy something for my two daughters. Oooh, she does wonderful work! I can’t decide if I’d buy a gift for me or a family member! So lovely, totally my style. Her site is so full of lovely designs that it would be hard to choose! Thanks for this contest. She makes the most beautiful jewelry! If I win, I don’t think I’ll be able to resist spending it on myself! If I win I would either buy something for myself :) or for my older sister for Christmas. That is tough. Everything is beautiful but I think that my sister deserves something beautiful. I’d like to say my sister, but it could be me! I’d love to buy something for my mom! I would split the gift card between myself and buying something for a friend. Spread the love! I would give something beautiful to my daughter who just had her first baby. Beautiful pieces! I’ve just moved to the Rocky Mountain front rage myself a few years ago and it is definitely an inspirational area. I would either get something for my sister or something matching for the two of us! 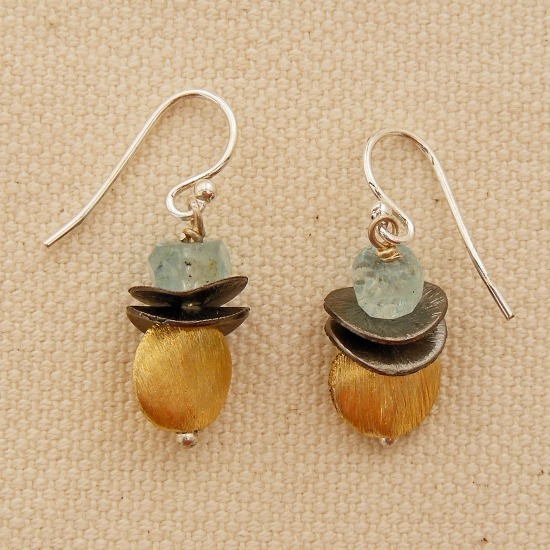 I really want to get something for my sister…maybe some awesome earrings! Thank you! What beautiful, unique pieces! You can tell she’s a real craftswoman. So many lovely pieces, but I really like the Floating Leaf Turquoise Bracelet. I also love all the rings. Beautiful and unusual jewelry. Perfect for the holidays! I would probably find something for myself. I don’t own a lot of jewelry. I would probably split it…and share with my daughter. I would treat myself. I don’t wear a ton of jewelry buy I love her style. i love the metaphysical properties inspired jewelry. really amazing! I would love to buy myself something! I would use the card to buy my Mom a piece of jewelry. Her birthday is in January and being so close to the holidays, is a little hard to think of lovely things like this in good time! I think I wuold use it as a gift for my daughter. I’m going to buy a gift for my mom. Thanks for the opportunity! I would buy something for myself! Something for my Mom and myself! Hi Winnie! I would definitely buy something for myself– jewelry is so personal that it’s hard for other people to choose something I love, and I always assume the same about others. Would so love to win…your items are gorgeous ! I would use the gift card for Christmas gifts. I would use it to buy a gift for my best friend who’s birthday is in January. I think I’ve seen her work in Sundance before: quite beautiful. Thanks for the generous giveaway! Beautiful jewelry, so unique. I would love to pick out something for myself! Would use the gift card to buy a gift for my daughter or my mom. Gorgeous! Will be ordering gifts for my daughters. And, if I win, will get myself something beautiful too. Thanks! I love that you’ve teamed up with Elizabeth. I’m lucky to live near her and have bought many pieces from her at various farmers markets and art markets over the years. Her jewelry is unique, simple and gorgeous! guitar solo where the guitarist is not doing a lot of fancy bends or hammer-ons.